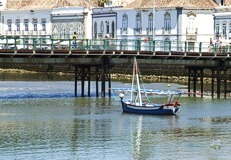 Tavira is sometimes referred to as the ‘Venice of the Algarve’, and is considered a real gem. This beautifully elegant and unique fishing town dates back to 2000 BC, and its character is very representative of the region. The original seven arch Roman Bridge still stands today, which is why, the. Its fine Renaissance architecture and numerous churches with tree lined squares almost take you back in time. The Market Hall on the riverfront has several shops, cafes and restaurants around its edge, with the central area where special events and exhibitions take place. There is also an abundance of concerts and festivals throughout the year guaranteeing there will always be plenty to entertain you. You can also catch a boat that departs regularly for Ilha de Tavira (Island of Tavira), where you will find miles of white sandy beaches awarded the Blue Flag for quality. Combined with water temperatures between 16c to 20c, in the summer, it is nothing short of idyllic. If you wish to stay at a top quality hotel with a difference, look no further than the Pousada Tavira, also known as Hotel Convento Da Craca. A former 16th Century convent, it has been carefully restored retaining its heritage and ancient architecture. The rooms are extremely comfortable some with small balconies, terraces and even a private garden. The Pousada has a gymnasium, two swimming pools (one for adults and one for children) providing you with everything you need to enjoy a few days away. It is worth noting there are many discounts offered when you stay at a Pousada, and pousadasofportugal.com has a free, fast, personal service with experienced staff to help you find the best deals. For example if one or more guest in a room is over the age of 55, you are eligible for the ‘Golden Age’ discount (subject to available rooms) of up to 50% off! When booking through an instant booking site, many are only allocated a limited number of rooms at discounted rates. If told that there is no availability for a discounted room, pousadasofportugal.com may be able to book a room for you, since they have access to all unsold rooms. For the keen golfer, the hotel is conveniently located near the Benamor golf course, designed by Sir Henry Cotton, and offers fabulous views of the mountains on one side and the sea on the other. If bird watching is of interest, visit the salt pans south of Tavira, where salt water is evaporated creating Portugal's purest table salt. It is also a popular wading site for flamingos in summer, and thousands of migrating birds in the autumn. The Ria Formosa National Park is magnificent with its blue lagoons, white beaches and islands covering 60 km along Portugal’s coast. Within the park is the Hotel Vila Gale Albacora, where you can visit a tuna museum, which explains the fascinating story of why tuna disappeared from the region. The hotel is unusual in that all the original fisherman’s cottages have been converted into rooms. Like the Pousada, it is certainly an interesting alternative when looking for accommodation and, at the very least, an ideal place to stop for a drink or a meal while you are visiting the Park. The surrounding countryside of Tavira is still very rural and unspoiled, with its dazzling whitewashed houses decorated with traditional borders and ornate chimneys. The beach front villages of Santa Luzia, and Pedras del Rei where you will find an olive tree that is said to date from the 17th Century, are both worth a visit. Other villages of note are Luz de Tavira, which has the finest examples of Manueline craftsmanship (carved stone) around the southern door of the Parish Church. The Torre de Aires has the remains of a Roman villa. To the east of Tavira, and overlooking the sea, is the charming traditional village of Cacela Velha, with lovely views of the tidal lagoon and sea. The nearest airport is at Faro and has airport transfers to Tavira. With such a diverse range of interesting experiences, Tavira has to be one of the most delightful destinations you will visit in the Algarve. .